On December 26th, 1902, came into port after life’s changeful voyage Janet Carr. Her ‘coming in’ was stormy by reason of long and painful affliction. Still her flag flew bravely and she approached and gained the shore in confidence and joy. It was at Little Hoole, a quaint mid-Lancashire village, that our sister was born on December 11th, 1853. 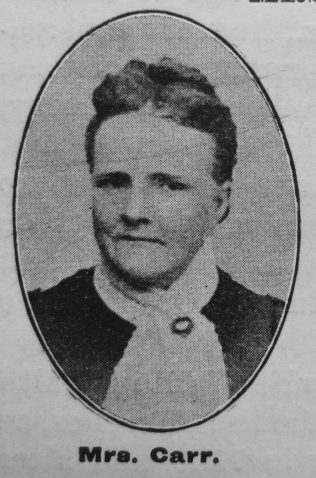 She was the daughter of Henry and Ann Rowcliffe, the former of whom, though long entered into rest, is still remembered as an earnest, acceptable and laborious local preacher, while the name of the latter is recalled for her piety and good works. There were six children in the family, and it says all that need be recorded concerning the parental character, teaching, and example, that five of these children having been called homeward were found secure in the faith. It speaks volumes, too, for the connexional loyalty of Henry Rowcliffe and his wife that all these children died in fellowship with our Church. After residing in Blackburn until the morning of womanhood Janet Rowcliffe came with her parents to Preston. At once the family found a home in the church worshiping – then in Brook Street – now in Fylde Road. Here Janet was a Sunday School teacher, and here, too, she met with Mr. Job Carr to whom in 1884 she was mated in a union which has been singularly happy. The history of Brook Street Society has been one of struggle and success. In that struggle our sister bore her part. In that success she thankfully rejoiced. It must not, however, be supposed that her contribution to the growth of the Church was of a public and prominent character. From such labour as this she shrank alike because of taste and temperament. But there is other work for the devout women of our churches than preaching and speaking. To do this other work was her delight, and she did it constantly and faithfully. Her poverty of spirit, her sympathy with suffering, and thoughtfulness for the poor, her patience in affliction, her simple faith in God, were marked excellencies in her character. At home the influence of Mrs. Carr was on the side of all goodness and kindness and peace. Three children were given to her, and her chief concern was to lead them to living fellowship with the Redeemer. She felt it her business, too, to encourage her husband in the way and in his attachment to our Church. He has confessed that more than once in the disappointments and misunderstandings incident to official life he has had thoughts of seeking another spiritual lodging, and that it was due to his wife’s advice that in those crises he remained true to the Church of his choice. That he has steadily risen in usefulness and honour until now he fills the position of steward of the Preston 2nd Circuit is, he admits, due under God to her whose loss he mourns to-day. As she delighted to live among the Primitives, so she elected to sleep among them at last. We laid her to rest in the burial ground of our old sanctuary at Little Hoole, near the remains of father and mother, of a brother and three sisters. It was a wild day in a dark December, but there was a light upon the open grave and at promise in the storm. Janet’ father, Henry, was a porter in 1861. She married Job Carr (1852-1924), a police officer, in late 1884 at Preston, Lancashire. Census returns identify three children. Note: Records have her maiden name as Rowcroft, not Rowcliffe.